The 3DS XL launch is almost upon us, but thanks to our godly status in the world of Nintendo, we've been sent a pre-release retail unit to touch and fondle. Thanks to our steadfast belief in the spirit of sharing, we thought you might like to see what the 3DS XL looks like when placed alongside its smaller sibling, the vanilla 3DS. It's worth noting that this UK model comes without a wall charger (it's the same deal with the Japanese version), but the North American edition will have one in the box. Without the charger, there's actually very little to the 3DS XL packaging - all that is contained within the box is the console itself and the usual chunk of manuals and paperwork, all translated into roughly 3,605 different European languages. We'll have a full review of this new console on the site in the not too distant future but in the meantime, feast your eyes. I'll get my hands on one when Black Friday swings around. Hopefully the white one comes to America by then! 3,605 languages??? What?! How does that work?? Although I'd have to trade in my 3DS for it, and I have games I'd want to transfer over. Is it feasable to be able to transfer games in store (DSiWare that I've had since DSi, 2009, etc.) or am I going to have to take the hit, and sell the 3DS afterwards (and miss on any trade in bonus)? @Millenia It was a joke. There are only 3,604 languages. when closed its really not that much bigger. dammit - its so tempting, but I can't really justify the purchase. Look like the D-pad is in a more comfortable position and the shoulder buttons are much bigger. I quite like the top screen portion being so slim too. Only one last tidbit I must know before being sold on this thing: Do the games look worse? 3DS XL? I'm going to get! Love the new design! But by the way: The USK logo is so annoying! Now they even print it on hardware boxes. Ridiculous!!! I'm German myself and witnessed the development here in Germany. Now they force whole Europe to use this s***! What do British people think about the logos?? EDIT: No second circle pad and ZLZR buttons. I still dunno why they didn't at least pack in a USB charge cable, but hoping one of the UK retailers considers bundling a charger in a deal or something. But still, roll on July 28th! Almost worth it just for the intuitive stylus slot. I'm tempted. And really, it doesn't seem that much bigger for my pocket. Am I the only one who hates this!? Also, why did they have to put the stylus on the side again? When you occasionally lose it, playing a button game without it there feels horrible! The 3DS fixed that for me. Why does Nintendo release this crap!? Could you guys take a couple of comparisons pics of DSi XL vs 3DS XL? Please? Nicei I'll be setting mine to Klingon. Hey! That's not an extendable stylus. It's a tad less thick apparently and the rounded edges might make it feel a bit better in a pocket. Can't imagine carry either around in my pocket though, really. The screens look bigger every time I see them, too. Looks nice. Just announce and show a side scrolling Metroid and I'll find it hard not to pre-order. I really hope this one isn't designed to scratch the top screen like my current one has. Also, word on resolution up-scaling? @MarioMario 3DS XL doesn't upscale the resolution. I HATE the fact that the stylus is back on the side. Maybe just maybe this site will convince me to get one, but only if Nintendo releases it in all black would I even consider it. Kudos to Nintendo, for not including an AC adapter, a compulsory part of every electronic device. My favorite feature is being able to have a better grip when using the D-Pad and it's great to have the stylus on the side. But the design is terrible, it's not shiny, it looks kind of like a DSi with a circle pad, and the stylus isn't even a telescope stylus. I don't think I want this. If Nintendo stored their games in a cloud like Sony and Microsoft, I could trade my 3DS in and redownload my games, but nooooooooooo, not Nintendo. I'm getting this because my 3DS' L and R buttons started to function weirdly to the extent I don't enjoy it anymore unless I'm playing a game that doesn't use them. I don't think they can legally sell that system new here in the states without a power cord. I think its the dumbest thing I've ever heard. I'd rather it have a 2 gig and a power Ford if I lived overseas! Nitpicking, but I don't like how they move the stylus around. Now after playing my 3DS, whenever I go play a DS, I'm always searching for the stylus where it doesn't exist. So which console are the LR buttons most like? GBA, Phat, or Lite? @Tech101 That's a silly thing to say. The US government doesn't (and shouldn't!) regulate things like which peripherals are included with a system. A large warning label on the front and back of the box is enough to deter any lawsuits that claim consumers weren't informed. Still, it does seem silly to sell the system with a dead battery and no charger, so that when you open it you have no way to use the thing until you obtain one. That's going to make for upset kids when the occasional parent makes the mistake of not reading the warning — like that ever happens, right? The review PinkSpider posted regarding the improved screen image intrigues me, however. I wasn't really considering getting this, but with that glowing review that the images look much better and the 3D "sweet spot" is actually LESS of a problem (I was thinking it might be more! ), I am now very tempted to pick one up when it comes out here in the states. @Nibelilt Uh... How about the 3DS? I hope the 3DS XL has a better D-Pad this time around. The original 3DS's D-Pad is horribly clicky, same goes for the buttons. Why can't they just use the buttons from the DS Lite? The U.S. government requires chargers so idiots like Lindsay Lohan don't use the wrong charger for their hair dryer and burn down the crack house. It's a safety issue. When it was announced, I kinda scoffed at this. I love the design of the original 3DS, and would never really want to trade mine unless I had good reason. Unfortunately... My L button has stopped functioning lately. I've tried the good ol' "blow into the button" trick, and while that used to work, it only works for about 5 minutes if I'm lucky, and I checked my warranty status online to see about sending it to nintendo, only to find my warranty just ran out and they would charge me 55 bucks to repair it. A little too pricey for me. Now I'm considering a 3DS XL only because the larger screens sound nice, the stylus has been repositioned to the side, where I loved it on the DSi, and my L button would work again. The only real downside I see to trading in is that I think the XL is far more hideous in design than the original. I was curious if a place like Gamestop would let me transfer my stuff before the purchase so I could use the original 3DS as a discount on the XL, but I guess if my L Button is pretty much dead, they wouldn't really take it as a trade in anyway. Ugh... Maybe I should just go buy a tiny screwdriver and fix my L Button myself. so there is no way to charge the XL without already having one? that's a really bad idea. Ugh, Dsi with a circle pad. I hate the dsi's baby building block colors. Nintendo, stick with shiny. For crying out effing loud! Who the f*ck cares about a second circle pad?!! THERE'S ONLY THREE GAMES THAT USE IT! The rest of the time you won't even use it! I actually might upgrade.. Didn't think i would change my mind.. but I just did..
@Guhin13 AUGH my old white DSi had that problem!! I have long sold it almost a whole year ago. I kinda miss it because I had a lot of DSiware games on it. If you ever get a new DS or 3DS and you don't want the non-working L or R buttons, my tip is to NEVER PUT YOUR DS OR 3DS IN YOUR POCKET! Keep it in a case or somewhere that doesn't attract dust. See, and that must've been my problem. I used to take it everywhere in my pocket on the off-chance I'd catch some street-pass tags, but seeing as that doesn't happen much for me anyway, I suppose I'll just stop. Part of me thought that I should get some sort of pouch to carry it in, but I suppose that poses the same problems as putting it in my pocket, eh? I really think I'm gonna upgrade to the XL now. I'll be sad to see my awesome Aqua 3DS go, but I'd rather get a new system with at least some minor upgrades than just a new original 3DS, no matter how appealing that Purple one is. Those screens really are fat...it's very tempting, but I still can't find a reason to buy the thing. will recharges comes with the box in Australia? in UK dose not have recharges. is Australia going have recharges same as USA? because comes same month NA August 19. Australia comes out August 23rd. I've had a go with this in the office, I think I prefer this to the standard model, its easier on the eyes and more comfortable to hold. Sadly the "3D sweetspot" isn't any easier to keep, but its still a nice model. The screens are much bigger without the unit as a whole being that much bigger than the original. I am really looking forward to having one and playing Resident Evil Revelations and Metal Gear Solid all over again! However the problem is that both those games saw me use a Circle Pad Pro! Where is the Circle Pad Pro XL? Great so I can read the manual "as Gaeilge"
You should have also put a wad of cash of around 50 pounds in between the two consoles for a even more realistic picture gallery. @NINTENDOFACE Pretty obvious from videos it won't be like i/iXL/3. Its ridiculous that there's no charger but I'm fine with my original 3DS anyway. Why are people calling the original vanilla? Also, since you said the manuals are all that come with it, does that mean there are no AR cards? 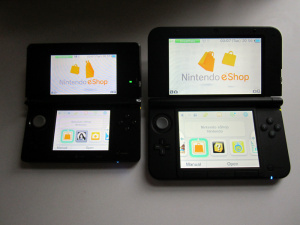 What was the retail game in the 3DS shown in the pictures? I really hate how you called the older 3DS 'old school'. It's much better than that huge piece of crap Nintendo is trying to get everyone to buy. It reminds me of the original DS, horrid. No charger? How are you supposed to charge it then?? I like the design, the rounded edges, the riddance of the shiny surface (no more fingerprints, yey! ), the fact that the console is not much larger in total but the screens fill out much more of the area. I dont like that they got rid of the 3D light symbol and that the home button etc look a bit plastic and have no more white writing on them. What i don't understand is why there isn't a charger for our fellow European and Japanese gamers? I feel like they are getting ripped-off. Should've been available at launch of the 3DS. Nintendo treating its customers appalingly again. The DSi XL was available then at the time of 3DS standard launch. Could've easily made a 3DS XL for launch as they just shown. The original 3DS also has only been around 2 mins. @PinkSpider I've just checked out that link you provided. Seems the larger screen works well on the 3DS XL. I can see myself considering selling my Aqua Blue 3DS as I've never really enjoyed the tiny screen and black shiny surround, especially with my DS games. I'm now really looking forward to getting one. @Shotgunryugan You won't lose the games you purchased, unless you have to trade in your 3DS on the day to buy a 3DS XL. Nintendo provide a System Transfer tool which you find in System Settings/Other Settings. It transfers all your games, Miis etc., and someone in one of Nintendolife's Forums who has done it twice said it works perfectly. You could always sell your 3DS after that to get some of your money back if you wanted to. I'd also like to see a comparison pic of it side by side with the DSiXL plz ? Considering how much more i love my DSiXL compared to my old DSlite i'm actually relieved now that i havn't been able to afford a 3DS yet as i can now just dive straight into the 3DSXL. I've seen the pics of the 3DSXL before today but what i hadn't noticed was just how thin the top screen is (pic 8). It looks to me like it is even thinner than the screen on the 3DS. Maybe this means that it will balance quite well when playing and reduce the need to play it on your lap as often. @LEGEND_MARIOID I suppose Nintendo waited, then unleased the XL model to make more money. Every company is at it, more so Nintendo. And Nintendo profits are well down, but I can't see the XL doing them many favours. Agreed. I said in the "momentum" topic that I thought it was a year too early for them to release this new design. Its NOT an upgrade at all, merely an alternative. Too much of a luxury for me in "Wii U year". They made the 3DS' screen as small as the DS Lite s (and therefore marginally smaller than the DSi) on purpose, so you would get a cosumersitic, aesthetic WOW factor with the new 3DS XL which they always had planned. No thanks. Great thing that they have changed the stylus dock back to the side as it where with the Lite and i versions! It's just much easier to pick-up while you are gaming, rather than searching after it with your fingers behind the upper screen...! It bothered me a lot! Looking forward to your review, to find out if I should swap my 3DS to this instead! As a lefty I prefer the stylus at the top. With the lite I would have to take it out with my right hand and then switch it! On another note, I'm glad to see they got rid of that unecessary green '3D' light next to the depth slider. I always found that off putting. i wish they hadn't moved the stylus, but i'm a lefty so i'm used to things being inconvenient. i'm glad it's no longer telescoping and, more importantly, not that damn slippery metal. So, I checked out a 3DS in the store again and I'd forgotten how incredibly tiny and inconvenient those screens are! Honestly, I'm not sure these XL screens are going to be big enough for me. Will need to see this in person before buying I think. For a while, I planned on waiting to buy a Cobalt blue 3DS when it would be released in North America. Now, I'll just pick up the blue 3DS XL. However, I still wished Nintendo would have released it until next year. To be fair, if it was available at launch it would've been it would've been over-priced as the original 3DS was! Then there would've been a price drop and a few more free DLs of GBA or NES games, that so many of us have already played. Remember when I was talking about appaling Nintendo cosumer treatment? And you can use your 3DS charging cradle with it, right? If so it would be interesting to see how the 3DS XL looks in it. Dunno if this has been asked here, can't read all the comments right now. Come on, people! Stop complaining about that darn charger! If you need one, you can buy it separate. No problem. If you don't need it because you already have one, it will be cheaper for you to buy your new 3DS XL. Stop acting like it's the worst thing ever. You're being whiny and childish. i kinda like the no-charger thing, I already have 2 chargers from my DSi and 3DS, although I broke one by accident but that's not the point. I KNEW they were going to put that stylus on the side... that's where it should've been to begin with instead of pulling a DS Phat and putting it way back behind the 3DS (and on the left side too grumbles this right hander). I love the new additions, but sadly, it's still not enough at this time to make me get one. If I come into some extra change, I'll purchase one and give my current 3DS to my ma, but I am in no way in a hurry. Can anyone tell me what size is the screen DS games will be displayed in ? I'll be purchasing a Nintendo 3DS XL, and since my family performs the hand-me-down system, I'll have to give my sister my Aqua Blue 3DS. I do, however, wish that the 3DS XL's design was a bit more... attractive. I have a question, I've heard the screens look better for original DS games, without the blur. I hope this isn't a stupid question... forgive me if it is - but do we know if there is the option to turn off the 3D like on the original 3DS?